As the days grow shorter and colder, the pigs at the PotterVilla homestead are growing bigger and bigger! We are also looking ahead to our fall delivery of Pork–Thank you to those who have already ordered and sent back your cutting instructions! You are an encouragement! We are currently looking at a butchering time around the end of November for the fall batch and then we will have a few more pigs available in January or February. If you haven’t put in your order yet there is still time–we currently have some pork available for this fall and are also taking orders for the first of next year. To all those who helped make PotterVilla Pastures’ summer a success this year–Thank You! We appreciate your continued support this year as we work to provide you with quality Pastured products–like the spectacular broilers that averaged almost 7lbs this year! As the summer winds down on this Labor Day Holiday weekend, we here at PotterVilla Pastures are thankful for the many ways God has blessed this summer and are looking forward to what He has in store for this fall. 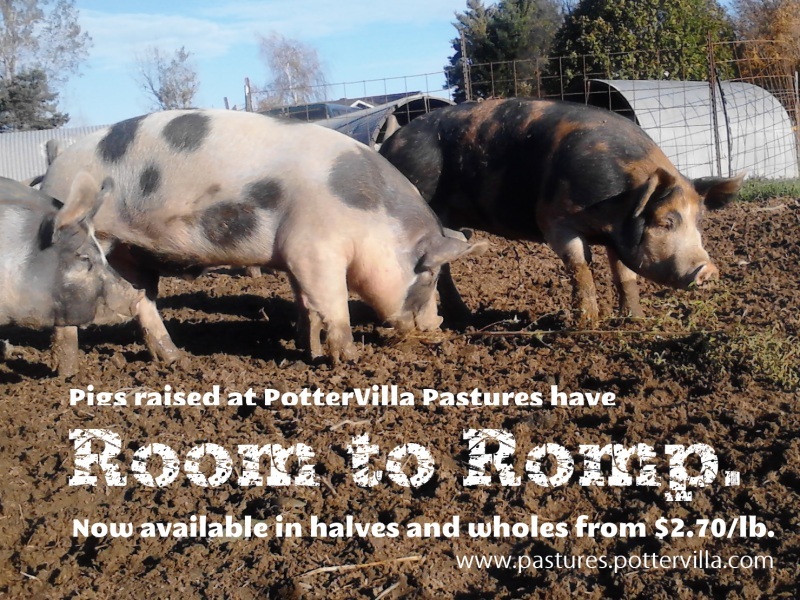 One thing on the horizon sometime in November is PotterVilla Pastured Pork availability! These porkers are currently spending the hot days lounging in their mud wallows, romping around and eating, eating, eating! If you haven’t had a chance to sink your teeth into some real pork since great-grandpa quite raising hogs, this is your opportunity. We are still taking orders for this fall–see the form on the sidebar for more information. 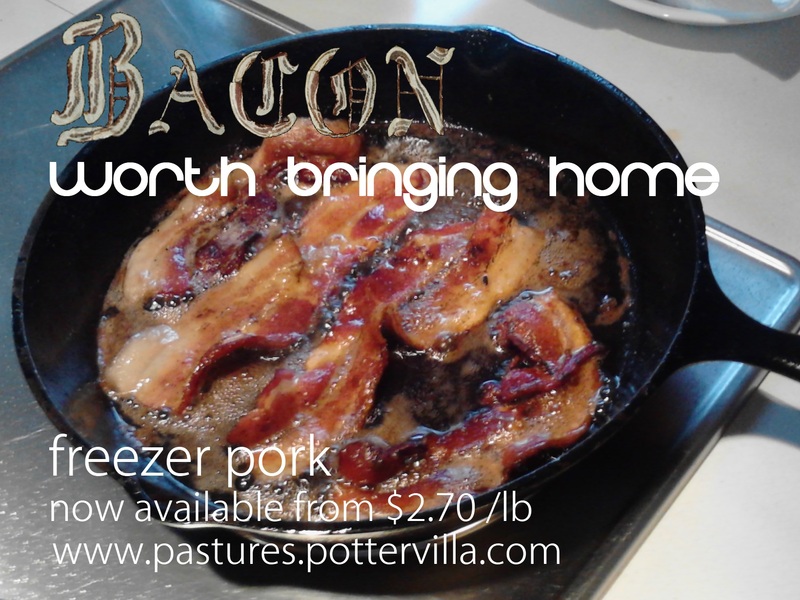 Great tasting pork is still available from PotterVilla Pastures! If you have been thinking about the prospect of having high quality meat in your freezer, but haven’t put in your order, now is the time to reserve your pork for the first of November. The days are flying by; don’t let this opportunity fly past with them! Raised outside with room to romp and root, the pigs that end up as PotterVilla Pastured Pork are a better class. While most bacon is raised on commercial confinement farms in cramped quarters, on concrete floors, our pigs have a more natural life—the proof is in the pork! We work with smaller first class processing businesses that have world class service and attention to detail. Try getting that kind of commitment from the big city supermarket! With many options for processing we can make sure you get the meat you like cut and processed the way you like it. For better flavor, for better quality, for better service, give PotterVilla Pastured Pork a try this fall! Quantities are limited so place your order now for a freezer full of high quality meat this fall. Hog are sold by 1/2 or whole, $2.70/lb hanging weight processing, smoking and all other fees included! When was the last time you had a grilled pork chop so good, you almost thought it was a T-bone steak?